When I found out that my employer Ordnance Survey would again be the official mapping partner of The Pearl Izumi Tour Series I was hopeful about the possibility of blagging my way to an event to hand out leaflets or maybe the marketing team might procure some merchandise to give away as prizes. 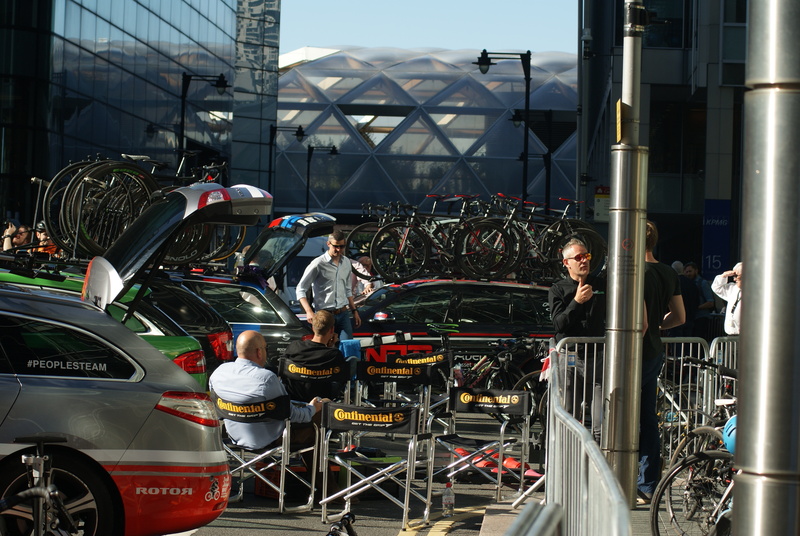 I never imagined that I’d be taking part and yet there I was in the pit area, discussing hill-climbing technique with Team NFTO Director Sportif Dave Povall waiting for the race to start. The Tour Series is five weeks of adrenaline fueled pro-level crit-racing in city centers up and down the country. Some of the top teams in the UK battle it out racing laps of courses featuring tight corners and unpredictable British weather. It’s the only domestic crit series to be televised and attracts thousands of spectators to every venue. 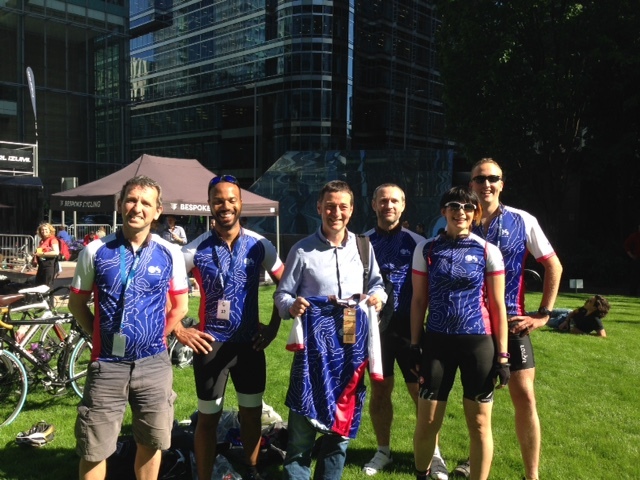 The Canary Wharf stage also features the Pro-Am Corporate Grand Prix which is a unique opportunity for event sponsors and Canary Wharf residents to race on the same circuit as the pros in a relay. Whilst it was clear that some businesses clearly had a more scientific method of selecting a team of 5, we decided to approach the event with a healthy dose of fun and chance; the team was selected by pulling names out of a hat and luck was on my side. 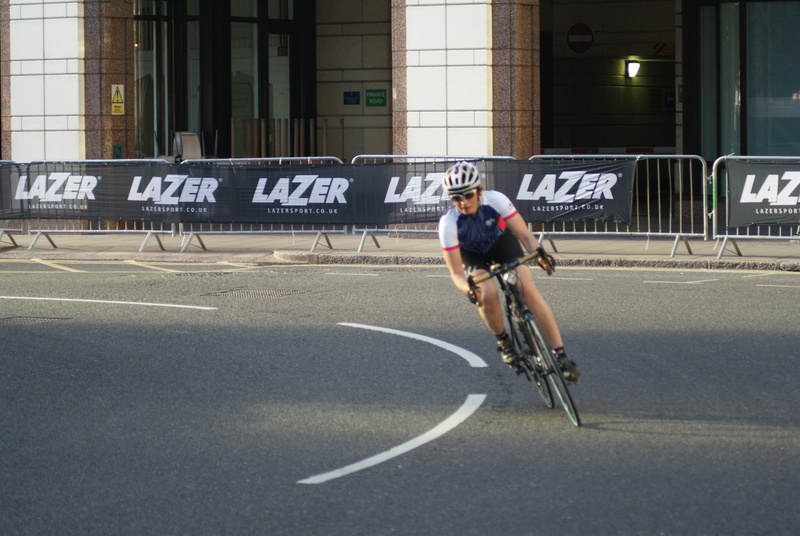 As the only woman in the whole of the business to volunteer I was determined to get a place; most cycling events have a woefully minute ratio of women to men (the last sportive I rode had a shameful 47 women to 614 men – that’s 7%!) so it was important to me to hopefully set an example that other women might follow if we send a team next year. So, the debut line-up of Team OS ended up as me, Andy Revell, Ray Patrucco, Richard Brettell and Matt Whitely. OK I’ve never raced on the road before but neither had the rest of the team. What better place to start though; the positive energy and atmosphere on the day took care of any nerves. So what if the other teams were rocking up on carbon-fibre beasts that cost the same as a small car whilst in our team there was a cyclocross bike complete with Brooks touring saddle and my bike had a bell on it? What we lacked in form we made up in enthusiasm. When Ned Boulting, in a rather surreal moment, asked me on camera if we were in it to win, I wasn’t lying when I said we were going to ride our hardest. The format was simple: each of the five team members takes a 1km lap, hand-clapping the next one into the race in the changeover area. 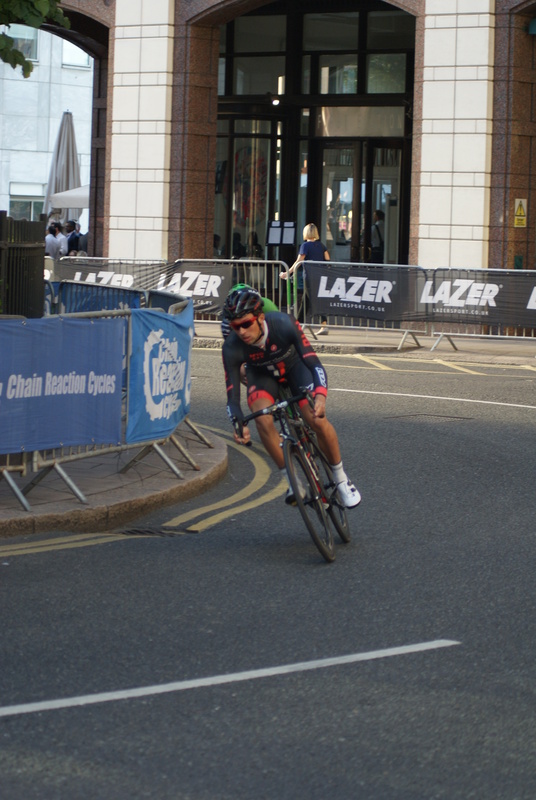 The final lap is taken by a pro-rider and we couldn’t have asked for a better choice than Ian Bibby of NFTO, the winner of the sprint competition at the previous event in Croydon. The course, a long rectangle, is deceptively simple on paper but a lot more fun in real life. By the time my turn came, the team already had a lot of ground to cover and I can honestly say I have never ridden that fast in my entire life. I was flying up the first long straight and it seemed like it took seconds to reach the first corner which I almost flew into but somehow managed to get round. Taking the short back straight and hitting the second corner all too quickly, I found myself on the long finishing straight, lined with spectators cheering and banging the advertising boards. The support was overwhelming and gave me the energy to push myself back to the changeover area to tag in the last man of team OS. I’ve no idea where we came in the standings. I know we were was close to the bottom but I think we went home feeling like winners that day. Post-race chillaxing in the VIP area yeah! Thanks! It was an awesome day!